The University of Washington in Seattle has done it again. For the third year, they’ve won the Green Cleaning Award for Schools & Universities Grand Award! What’s so impressive about this school is how they keep pushing themselves to do even better with their green cleaning program. This university is a true role model for the schools across the country. Today the program is doing simply amazing things. In a push to drive sustainability, the Custodial Department merged with the Recycling & Solid Waste Department in what is now called the Building Services Department. The MiniMax Waste Reduction program is an innovative new program that focuses on including building occupants in the process of waste reduction. 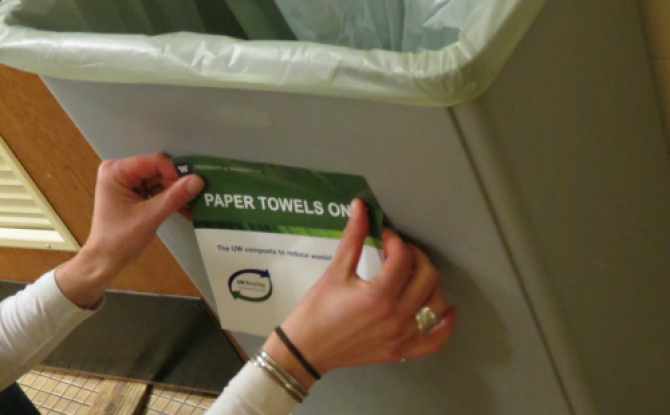 After achieving a 61 percent waste diversion rate last year, the program is now composting paper towels and providing composting bins throughout campus. They have made a complete switch to microfiber cloths, diverting an estimated 900,000 gallons of water from the sewer system annually. Chemicals are being eliminated as much as possible: The department has made the switch to chemical-free auto scrubbers that convert water into a cleaning solution for floor care and sterilize with dry steam vapor. “The changes that have been made throughout the history of the program support the pride our people take in their work because they have relationships with the customers they are serving,” says Emily Newcomer, Assistant Director, Recycling and Solid Waste. “In addition, they take pride in using safe, healthy green products that work.” She sees a real community sense in her staff, the students and the faculty. There have been changes that are based in green cleaning but reach much further. For example, the department now works on the day shift (with a small team that remains on the swing shift for emergency situations). This switch began as a way to conserve energy and cut power bills for the school but quickly became a morale-boosting life change for employees.